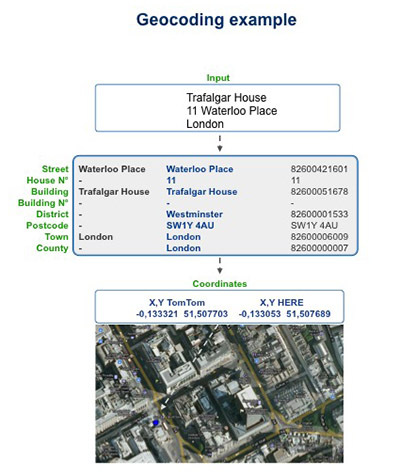 Address geocoding software: Try Egon! Address geocoding involves assigning precise spatial and territorial data and codes to specific addresses. In the preliminary phase this involves georeferencing which means assigning precise map coordinates to the address, to guarantee correct and certain map location. Need to locate a postal address on a map? In just a few minutes you will be able to convert a postal address into precise geographical coordinates (latitude and longitude) and vice versa. Then you’ll see the location on a map. Egon is a very powerful geocoding software package, which enables geocoding on multiple record databases, providing the validated format and map coordinates for any address. With the rapid development in geolocalisation technology and services, and the growing availability of territorial data from all over the world, it is crucial for each business field to carefully reconsider the strategic value of addresses and precise geographic data. Egon relates the data to the territory and by focusing on the highest level of details, gives a precise representation of the data, backing up GIS applications and creating catchment basins, areas of responsibility and of addresses, etc. Geolocalisation ensures that any data is enhanced with the territorial and statistics data for the reference taxable micro-zone. With the use of any map, geolocalisation is completed with the display (including via web) of the precise mapping position. Logistics and transport: some very sophisticated logistics applications are available today, which can trace the goods itinerary in detail and in real time, meaning that the itinerary can be planned effectively beforehand through the various intermediate points. Correct address tracking by street number allows noteworthy savings in resources and time. Geomarketing: by means of the automatic backup from Egon software, certain applications addressed to Geomarketing research enable reconstructing all the most important data about the business potential of a certain location or area. Address validation and georeferencing is preparatory to any subsequent Geomarketing analysis.